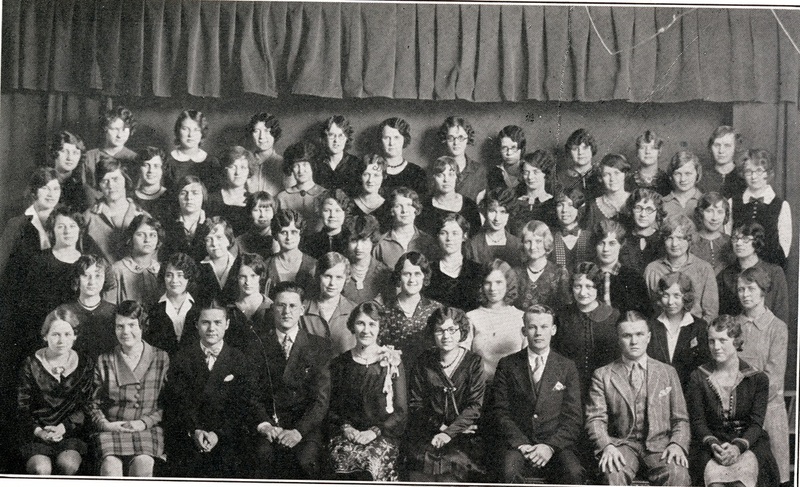 Each year, students and faculty gathered in the Old Main gymnasium for a program often consisting of music, drama, and oratory. Under the Christmas tree lay gifts purchased for no more than 10 to 15 cents that were exchanged among students and faculty. The evening closed with a favorite Norwegian tradition--caroling around the Christmas tree. Concordia’s Christmas traditions changed in 1927 when the first Christmas Concert was held in Old Main’s chapel on December 15th. Organized by piano and organ professor Clara Deua and the Concordia Music Club, the first concert was given with the same passion of today’s productions but on a much smaller scale. Professor Herman Monson directed the choirs with Duea’s piano accompaniment while students pantomimed the nativity scene and a women’s sextet harmonized off-stage. Other highlights of the event included the reading of the Christmas gospel by President Brown and Reverend Carl B. Ylvisaker’s oration about the origin and meanings of Christmas hymns. To close, the audience joined the choir in singing “Joy to the World” before moving to the gymnasium for the annual Christmas Tree Party. 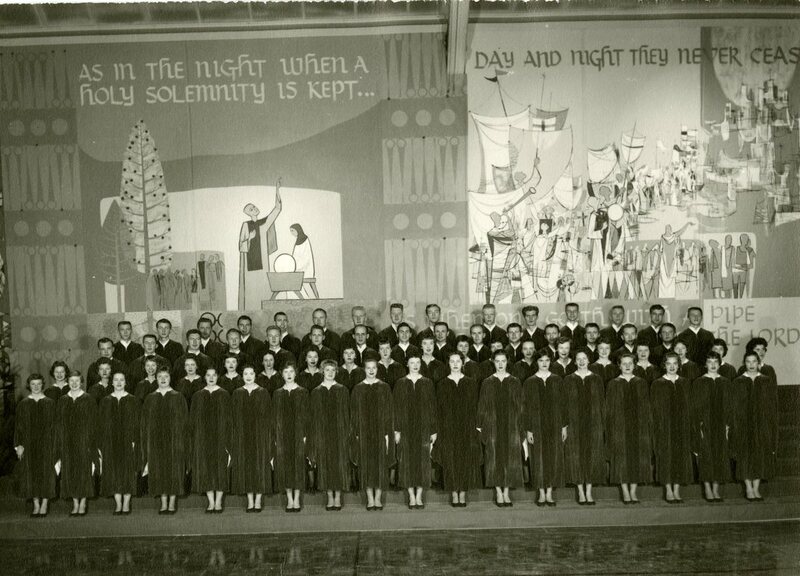 As the Christmas Concert established itself as an annual tradition, the venue for the concert changed in order to accommodate increasingly larger audiences. In 1928, the concert was moved from Old Main to Trinity Lutheran Church, and in 1937, Fargo’s First Lutheran Church hosted the event. For the next five years, the site alternated between Trinity and First Lutheran. 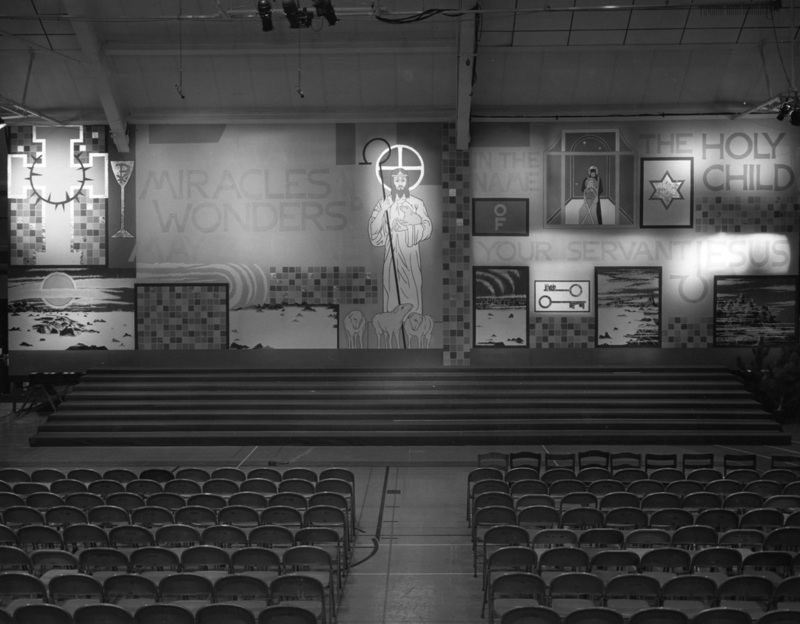 Due to space limitations, the Christmas Concert was moved to the Moorhead Armory in 1942. The concert found its permanent home ten years later when Memorial Auditorium was built. The Concordia Christmas Concert is nationally recognized for both its musical and visual artistry. 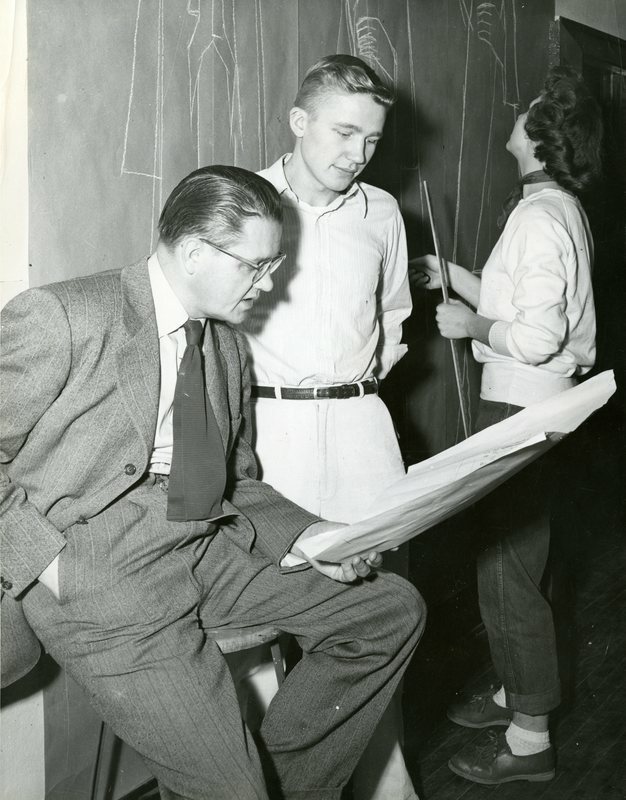 In 1940, art professor Cyrus Running came to Concordia and began leading the concert’s art direction. The first backdrop he designed consisted of a single star suspended in front of draped blue sateen flanked by two faux stained glass windows. 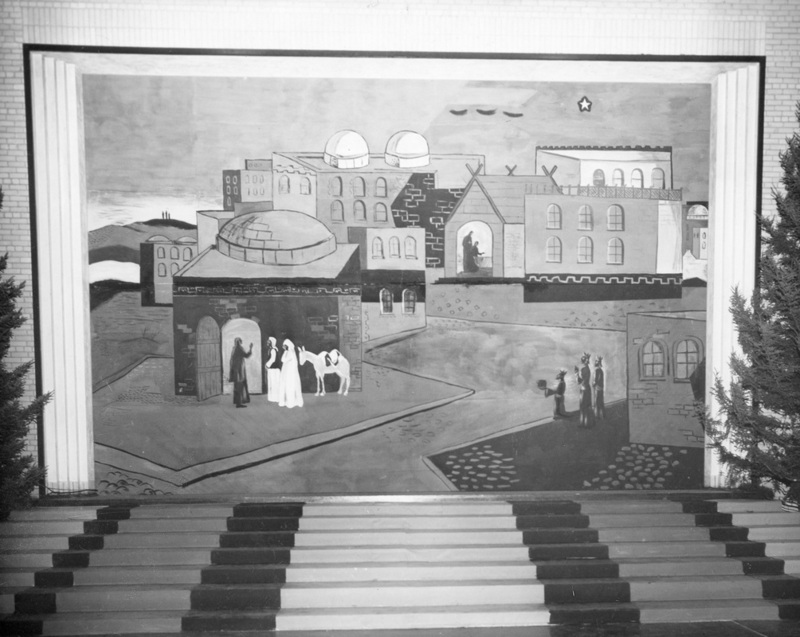 When the concert moved to the Armory in 1942, an acoustic backdrop was needed. 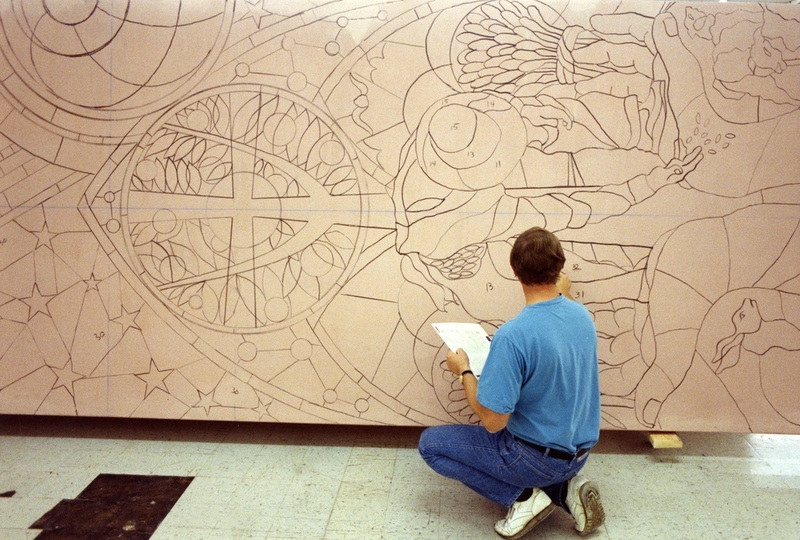 Painted murals thus provided a functional purpose and aesthetic pleasure. 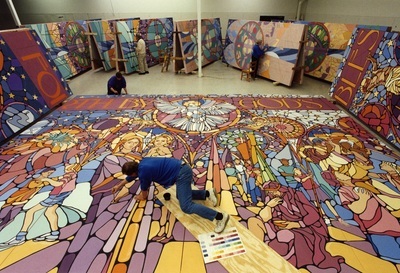 The acoustic backdrops became a vital component of the concert when it moved to Memorial Auditorium due to the extensive space. 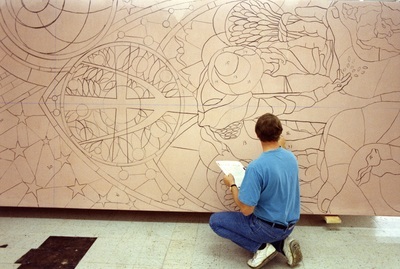 This larger venue simultaneously allowed the murals to become more expansive as well. 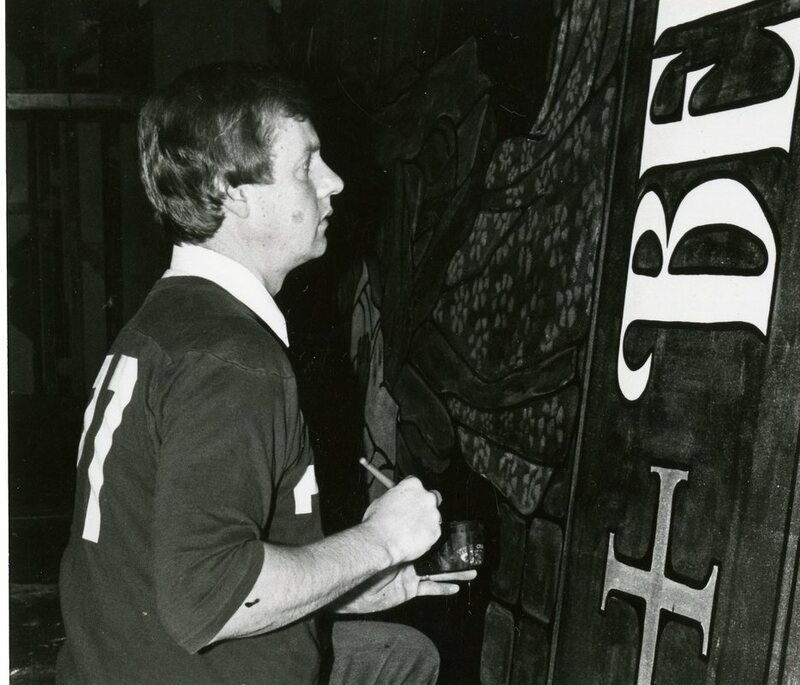 In 1973, Professor Paul Allen replaced Running who retired due to poor health. 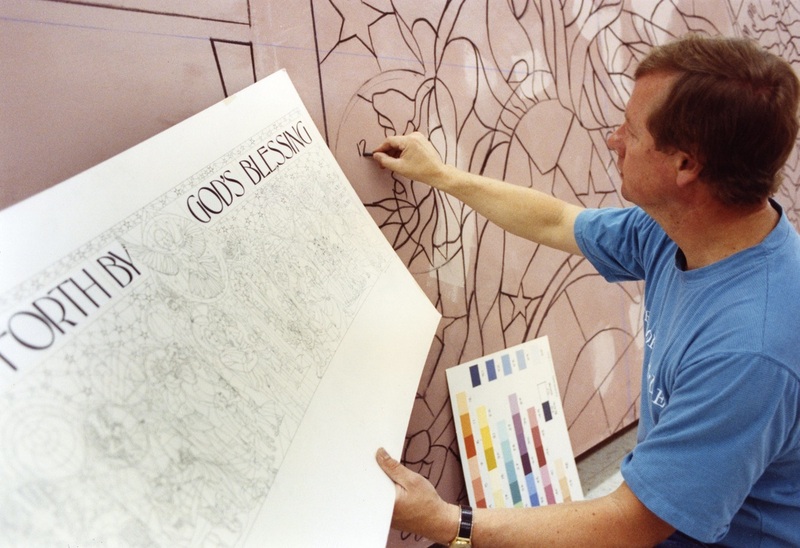 Allen continued to design the murals until his own retirement in 1977 at which time David Hetland assumed the mural tradition. 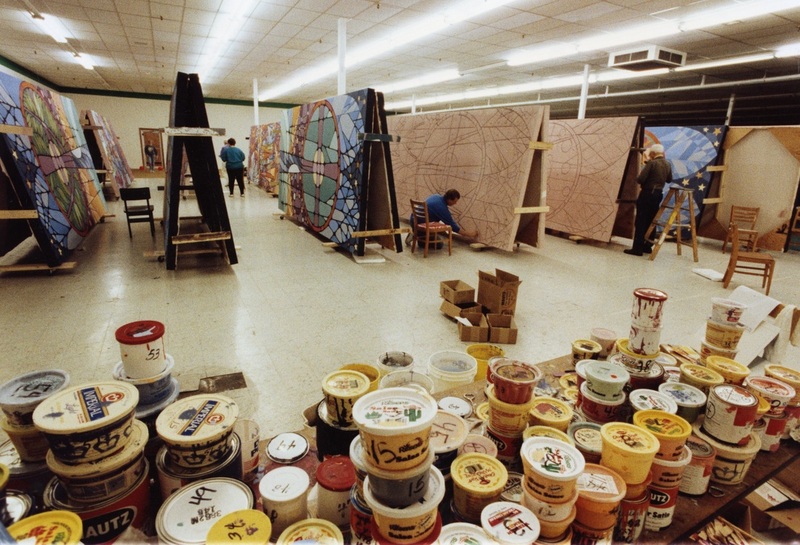 Hetland, one of Cy Running’s students, once humorously described his art as “disposable” that is “best when viewed in the dark and from a great distance.” For the next 28 years, Hetland continued to dazzle concert audiences with his works. 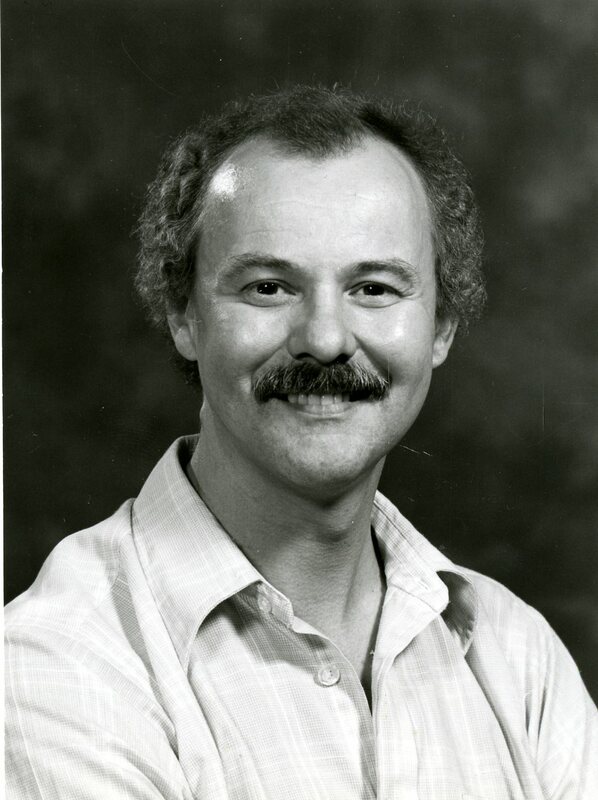 Carroll Engelhardt, author of Concordia’s centennial history, stated, “The Christmas Concert symbolizes the Christian community of Concordia…it involves the time, talents and teaching of many professors and students who dedicate themselves to this annual celebration.” This year, Concordia will continue its holiday spirit as its annual Christmas traditions have done for over a century. Carroll Engelhardt, On Firm Foundation Grounded: The First Century of Concordia College (Moorhead, MN: Concordia College, 1991), 358-9.